The death in May 2000 of John Cardinal O'Connor, archbishop of New York, was a vital loss to countless millions. A shining, openhearted crusader for traditional values in an increasingly bewildering culture, O'Connor was a pioneer for the new face of Catholicism, mapping out an unequivocal political and ethical code that stood for unconditional charity, civil liberties, and social justice. His widespread influence and spiritual presence are still felt strongly today. Now, for the first time, one of last century's most inspiring voices for humanity, conscience, and compassion is celebrated and remembered through the words of those who knew him best. 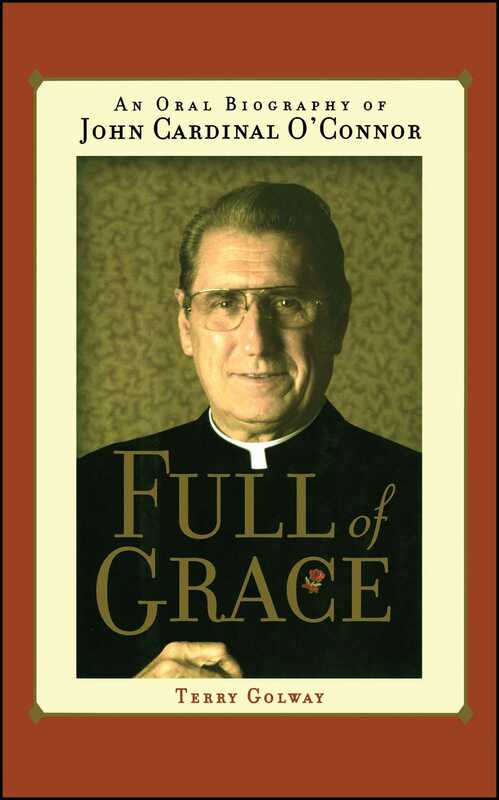 Renowned author and journalist Terry Golway shares a diverse collection of intimate stories and accounts: from former New York Mayor Ed Koch, one of the archbishop's closest friends, to fellow clerics he inspired, to all manner of laypersons around the country whose lives were touched and changed by this vital pillar of the Roman Catholic Church. With never-before-seen photographs throughout, along with fascinating, previously unpublished correspondence to and from O'Connor, Full of Grace is a gorgeous tribute and an unprecedented remembrance, affording full access to the vast heart of the extraordinary man who once famously understated, "I hope that in each place I've gone, I saved some souls." It was a few years ago, I think, when the National Endowment for the Arts funded a catalogue that described me, the Archbishop of New York, as a "fat cannibal in skirts." I only took exception to being called fat. He told people he had a "Phildelphia sense of humor," which in itself suggested he was making a joke that only he understood. Cardinal O'Connor was a man of humor -- irreverent humor, aimed at colleagues and at himself. Those who visited his residence or met him at a formal dinner often were rendered speechless by an unexpected aside or a flip remark. Yes, the Cardinal Archbishop, a man of the utmost reverence for God and his faith, had a comedian's sense of timing and an intellectual's appreciation for irony. On his desk in his law office in West Caldwell, N.J., Thomas Durkin Jr. keeps a replica of a potato. Next to it is a vintage black-and-white photograph taken in 1919 of his father and namesake, wearing the uniform of a Newark police officer. "My father gave me this," he says, pointing to the potato. "He also gave me the following admonition: ?Keep this on your desk, and any time you think you're a big shot, take a look at it so you don't forget where you came from.'" Mr. Durkin's sister, Veronica Durkin, introduced him to Father John O'Connor more than 40 years ago. When O'Connor was appointed to the New York Archdiocese, Mr. Durkin's friendship with him deepened. He and his law firm, Durkin &amp; Durkin, worked behind the scenes pro bono for the archdiocese. He had the Cardinal's private telephone number: "The Cardinal once said to me, ?Only seven people have this number. There's the Pope ...' I interrupted him and said, ?I don't want to hear the others. The Pope is enough.'" After Louis Freeh had been nominated as FBI director [under President Bill Clinton], he and I were going to have lunch. After the arrangement had been made, the Cardinal called on some matter. It wasn't unusual for him to call, whether it was midnight or six in the morning. He suggested a meeting, but it overlapped with the lunch that Louis and I were going to have, and I mentioned that. Out of the blue, the Cardinal said, "Does this guy object to having lunch with the Cardinal?" I said, "Are you kidding? This guy would give his left hand, and maybe his right hand, to have lunch with you." He said we ought to do it. So I called Louis back, told him what the new arrangement was, and I thought he was going to jump through the damn phone. So it's arranged that the three of us are going to have lunch at the Cardinal's residence. Now, this is my right hand to the good Lord, over the next half an hour, I got calls back from Louis, and those now scheduled for lunch grew from just us three to Louis's wife, to Louis's mother, to Louis's father, to Louis's brother, to Louis's cousin who was a priest visiting from New Orleans to Louis's secretary to Louis's four kids. In the middle of this, Louis said to me, "Don't you think you ought to check back with the Cardinal about this?" I said, "Look, I know him well enough to know when I have to check about something, and adding members of your family for lunch isn't something I have to check." So after this is over, I'm again talking to the Cardinal and I tell him about the new arrangments. And the Cardinal says, "Listen, tell that guy we don't have any more leaves for the table." The day of the lunch, I had to be at the residence beforehand on another matter, so I was there when Louis arrived. He was with his driver, and he asks if there was a place where the driver could sit and wait. And I said, "Oh, the Cardinal has taken care of that already." He said, "Really?" And I said, "Yeah, there's an extra seat at the table because he knew you weren't finished with your invitations." I once got a call from somebody in law enforcement asking if I had ever met a certain person, who happened to be the chair of a major company. And I seemed to remember thinking that Cardinal O'Connor had introduced me to this person. So I called him, and said, "Some time ago, did you introduce me to so-and-so?" And he said, without batting an eye, "Yes, and like most other times I've introduced you to people, I've regretted it ever since." In the mid-1990s, I served as counsel for a Vatican commission looking into a dispute in the diocese of Corpus Christi in Texas. The members of the commission were Cardinal O'Connor, Cardinal [Bernard] Law of Boston, and another bishop. We had to go to a meeting in Chicago, which coincided with the Democratic National Convention there in 1996, when Bill Clinton was nominated for re-election. During the meeting, we broke for lunch, and my friend who's driving us says he's made arrangements already for the two Cardinals and myself. He tells us he's taking us to a hotel dining room. As soon as Cardinal O'Connor hears that we're going to a hotel, he says, "No way. We're not going to lunch in a place where we might run into convention delegates. I don't want to get involved in that." This significance of that statement was that Bill Clinton was trying his damnedest to get the Cardinal to give the invocation at the opening of the convention. But Cardinal O'Connor had no time for Bill Clinton. Anyway, my friend says he knows of another place for lunch. We get in the car and drive maybe four blocks, and we pull up in front of this Irish place, Captain Maguire's. I got out and looked around and thought, "This is the place we're taking the Cardinals to lunch?" The bartender spots Cardinal O'Connor coming in and I thought his Adam's apple was going to do a jig. Whoever expected a Cardinal to come into a place like this? And you know, it was one of the most enjoyable lunches we had. But if instead of Captain Maguire's, we had gone to the governor's mansion in Illinois or the White House, it wouldn't have made a difference to the Cardinal. He'd be the same person, and would act the same way, whether it was Captain Maguire's or the White House. That's the way he was. There was nothing you could bring up that he didn't know something about. Usually he could top you with a story. I thought I had him once. My third child, Mary, was born at home. My wife went into labor and 40 minutes later the baby was born. We never got to the hospital. I delivered that baby. The next time I saw him, I thought, "Well, I've done something he's never done." So I tell him the story, and he says, "Did I ever tell you about the time I delivered a baby?" I said, "You're kidding me." He was a Navy chaplain in Maryland, and an officer's wife was in labor. He was with them in the car speeding to the hospital, and he wound up delivering the baby. Again he topped me. I did it on my living room floor; he does it on the backseat of a car. I met the baby the Cardinal delivered years ago, when he was in the Navy. He was in his quarters one night, the time when babies like to be born, and he got a phone call from a woman on the base whose husband was on a ship, who said, "I'm going into labor." In those days, of course, they drove wide-bodied cars, and he told his secretary, "Call the hospital and tell them to expect us, and get the car." As the Cardinal later explained it, they went under the first bridge [on the way to the hospital], and he heard "Ohh!" They went under another bridge, and he heard "Oh, momma!" And before they got to the hospital, he knew he would have to deliver that child. So he does, and now they're at the hospital, and the doctors and nurses come running about, and he tells them, "Slow down. It's all over." He had the baby in his arms. There's a postscript to the story. It was a Sunday morning, and I was at the Cathedral, and Monsignor [Gregory] Mustaciuolo, one of the Cardinal's secretaries, came over to me and handed me two coloring books and two boxes of crayons. "In a minute," he said, "you'll see who to give this to." And then this lovely-looking couple with two children, one in arm and one in hand, comes walking to the first pew. After the Mass, as was customary, I was invited to the residence. As we walked in that day, I saw this same lovely couple saying goodbye, and when I heard the mother say to her children, "Say goodbye to the Father," not, "Say goodbye to His Eminence," I knew they were special in some way. So then, when we sat down, he said to me, "Do you know who that was?" I said, "No, I haven't the slighest idea." So he told the story about delivering the baby, and explained that the mother was that child. And then he adds that after he delivered the child, he went to the nurse's station to clean up. He was then handed a paper to sign. He looked at it, and it said: Physician of record: John J. O'Connor. And he said, "I was just so happy that my name wasn't listed under ?father' that I just signed it." He then held his head and said of the two young children, "You know, they've been here for three days, and they're not used to these wooden floors. And you know, Sandi, there's a lot to be said for celibacy." In 1999, one of my clients offered to donate $50,000 to charity to commemorate my 50th wedding anniversary. I told them to make the check out to the Archdiocese of New York. I brought the check up to the Catholic Center on First Avenue. I went up to the top floor, where the Cardinal's offices were. He was in a dining room off the conference room, and there were a few priests in there with him. I explained that this client was making a donation on the occasion of my anniversary. I leaned over and handed him the check. He adjusted his glasses, looked at the check, looked up at me, and said, "Why didn't you tell them it was your 75th anniversary?" Once we invited him to talk at one of the Anti-Defamation League dinners. He was there to help present a booklet we had put out. During his speech, he told a story about how he once went to a Reform synagogue and he was the only one there with a yarmulke. Several Reform rabbis who were there looked at each other?I think they couldn't believe it?but everybody was laughing. The Cardinal had a serious point, too. Later that night, he said that he was in pain because there are Jews who do not want to exercise their Judaism because of assimilation or other reasons. It is their duty to practice their faith, he said, to prove that God exists and to refute the Holocaust. He sounded very much like a rabbi when he spoke. I think he just had a way with Jewish audiences. The crowd was all around him afterwards, shaking his hand and embracing him. I told him that if he ever needed a job I knew a congregation that could use him. He could be a remarkable rogue at times. He was unabashed with public personalities. He could tweak the beak of anybody without a second thought. It was never cruel, although I think it perplexed some people. And he appreciated humor in others. "Simon, Son of John," a very poignant hymm. Nobody knew that any of these Cardinals could sing. And then Cardinal O'Connor, as he often said on these occasions, said that nobody could leave until they heard Bishop [Patrick] Ahearn sing "Danny Boy." Bishop Ahearn had a wonderful singing voice, and after he got through "Danny Boy" and one other song, there was tremendous applause. Cardinal O'Connor made some comment about Ahearn having a good voice although he was just a bishop. And Bishop Ahearn walks over to Cardinal Casaroli, stands next to him, and says, "Your Eminence, many a man has been made a Cardinal for far less than this." Cardinal O'Connor roared! The Cardinal asked me to travel with him to Ireland [in July, 1988] on a pilgrimage for peace and to pray at the shrine of Our Lady of Knock. And I said, "Sure." It was great fun to be in Ireland, and I tell people that I sat in that church in Knock for seven hours at a time, and after a while, those statues in the church began to move! I also had a rift with the Irish community during the trip. A television reporter asked me what I thought of the British presence in Northern Ireland. And I said, "Well, I think they're there as peacekeepers, trying to change things for the better." That got headlines back home. In the House of Commons, Maggie Thatcher commended me! That's all I needed. Members of the House got up and said I should be invited to Britain. Ay, gott! It was awful. The Cardinal came home a day after me, and he gets off the plane and all the reporters are there. And -- I heard him say this on television -- he's asked, "What did you think of Mayor Koch's comment about the British?" And he said, "The dumbest thing I've heard in years." [Bursts out laughing.] At that time I wasn't so crazy about it. Now it's funny. The other trip I took with him was when he was elevated to Cardinal. We had a wonderful dinner that night, and that's when he made the statement he repeated over the years, that only in New York could two people who are constantly suing each other be such good friends. That was rather sweet. I would always go to St. Patrick's for Midnight Mass at Christmas. I don't think any of my illnesses kept me away. He would always introduce me, which is not so unusual, but after he introduced me, it would be followed by a comment. Something like, "There are 3,000 of us in St. Patrick's tonight, and many of you are not Catholic and will not know what to do at particular moments during the Mass. You may feel embarrassed. Do not. Look in the direction of Mayor Koch, and whatever he does, you do." And he had another one, which was, "Mayor Koch is in his seat. Let the Mass begin!" [Laughs] That was sweet. That was extraordinary. Patrick McKernan is the secretary general of Ireland's Department of Foreign Affairs. He is a former Irish ambassador to the United States. The Cardinal was one of the guests of honor at a fundraising dinner for the American-Ireland fund in New York in the late 1980s or early 1990s. He was there in his ecclesiastical garb. Also at the dinner were Tony O'Reilly, the former CEO of Heinz, and his wife. As it happened, Mrs. O'Reilly and my wife were wearing the same exact black dress, even though they had been separately assured that the dresses they were buying were one of a kind. The two women at one point were standing on either side of the Cardinal, and Dr. O'Reilly said, "Your Eminence, they look like they could be your female acolytes." Here's this conservative priest, and you wondered what he would think. But the Cardinal clearly found this amusing. When he did his first homily in St. Patrick's Cathedral after coming to New York from Scranton, I was sitting in the front row with Governor Cuomo and other dignitaries. I don't recall what he said, except that at one point early into the homily, he suddenly stopped and said, "How'm I doing?" Now, that's a phrase that has been associated with me since I ran for Congress in 1968, and even today people know the phrase. Everybody laughed, and then he said, "I'm not asking Mayor Koch. I'm asking the Mayor of Scranton." And there was a second round of laughs. After the ceremony, I went on the receiving line to meet the Cardinal. Governor Cuomo, because of his rank, was immediately in front of me. As he gets up there to shake the Cardinal's hand, the Cardinal says, "Mayor Koch, it's a pleasure to meet you." I thought Cuomo would have a stroke. [Laughs] It's hard for me to believe the Cardinal did it intentionally. But then I introduced myself. Ed Koch and I lined up in the cathedral -- and he always loved Ed Koch -- after the Archbishop's first Mass. He was going to greet us. I had been warned by some people who said, "You know, he's been told unkind things about you. He's got to get to know you." So I assumed he would know my face, and the difference between my face and Ed Koch's face. But when he saw me, he said, "Oh, Mr. Mayor, it's a great pleasure to meet you." I said, "Monsignor, the pleasure is all mine." [Laughs] Koch couldn't have heard this or he would have made some comment, I'm sure. I got a look from the Cardinal. I never forgot that somewhat awkward introduction. I told him once about something my son said to me about him. I had gone home to my wife and three kids and told them that I had just met with the Archbishop of New York. I was just starting to teach my son to play chess at the time, and of course his first question was, "Does he move on the diagonal?" The Cardinal had such a laugh at that.